The South Tynedale Railway uses rails set 2 feet, or 610mm, apart (the “gauge”) with a maximum line speed of 15mph (24kph). The locomotives and rolling stock being used have been obtained from a wide variety of sources, both in the United Kingdom and abroad.Much of the equipment is second-hand, and many of the items have been rebuilt, or have undergone considerable modification, before being used on the railway whilst others of the vehicles have been built new specifically for the Society, partially in the railway’s own workshops at Alston. №6: 0-4-0 side and well tank locomotive "Thomas Edmondson"
This locomotive was built by Henschel of Kassel, Germany in 1918 (works no. 16047) as one of many locomotives built to the standard German Army design of the period for the Tigris Kreigsbahn in Turkey at the end of the First World War. This locomotive was designated the number 125.However Tigris Kreigsbahn locomotive number 125 was never delivered and was stored at the Field Eisenbahn in Frankfurt until it was sold as part of a batch of twenty engines acquired by the Spanish Government. Steam locomotive “Thomas Edmondson” arrived at the South Tynedale Railway, Alston, Cumbria in 1984. It is a 90 horse power, 0-4-0 tank locomotive, constructed to a standard World War I German Army design and was built in 1918 by Henschel & Sohn, of Kassel, Germany, works No. 16047. Amazingly, it is the only one of the 95 of its class to have survived that is still in working order! It was restored to full working order and entered service in 1987 when it was named “Thomas Edmondson” to commemorate the 150th anniversary of the invention of the traditional style railway ticket. The locomotive was withdrawn from service at the end of 1993 with its boiler certificate expiring in 1994. In December 2002, the Heritage Lottery Fund awarded a grant for the restoration of “Thomas Edmondson” with the majority of the restoration work carried out by volunteers of the railway’s engineering department at Alston with the help of specialist consultants and contractors as required. Work started in March 2003 and was completed in September 2006. №10: 0-6-0 tank plus tender "Naklo"
Formerly used at the Naklo Sugar Factory, near Bydgoszcz, Poland, this locomotive was built at the Chrzanow workshops, Poland in 1957 as works no. 3459. 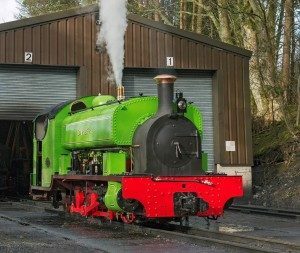 Originally fitted with both side and well tanks, the locomotive was completely rebuilt at Alston in 2001 without side tanks and with an improved tender. 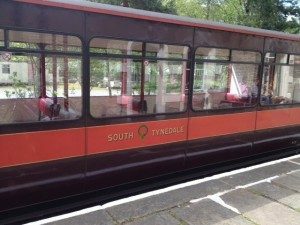 Naklo is now owned by the South Tynedale Railway and following restoration is painted with a maroon body lined in yellow with black frames and red wheels and buffer beams. “Naklo” arrived at the South Tynedale Railway, Alston, Cumbria in April 1988. It is a 70 horse power, 0-6-0 tank type “LAS” locomotive, built in 1957 by Fabryka Lokomotyw Imf Dzierzynskiego, Chrzanow, Poland, works No. 3459. This locomotive was imported from Poland, where it had worked at a sugar factory railway at Naklo. From 1945, all steam locomotive production in Poland was at Chrzanow, where 800 of the “LAS” type were built, between 1946 and 1959, for industrial use on 600 mm (2 ft) and 750 mm (2 ft 6in) gauge lines. This locomotive was originally built as a tank locomotive, the tender was a later addition. It was supplied new to the Wapienno Lime Works, near Szubin, it was transferred to the Znin Sugar Factory (No. 2) in 1966 and then to the Naklo Sugar Factory, near Bydgoszczn in 1977. Here it was converted to run with a tender of a typical Polish design, giving greater coal and water capacity and worked until March 1987. Built by Hunslet Engine Company of Leeds in 1937, works no. 1859 this locomotive formerly worked for the Umtwalumi Valley Estate sugar plantation, Natal, South Africa.This locomotive arrived back in the UK in 1997 and placed into storage before coming to Alston in January 1998. It is currently dismantled requiring a complete major overhaul. Hunslet steam locomotive No.16 arrived at the South Tynedale Railway on 30th January 1998. It is a 90 horse power, 0-4-2 tank locomotive, built in 1937 as works No. 1859. This locomotive was exported to the Umtwalumi Valley Estate, a sugar plantation in Natal, South Africa and numbered UVE No. 1. It was taken out of service in the 1980s, becoming a static boiler and was mounted on a plinth in Mount Edgecombe, South Africa in 1991. It was returned to the UK in the autumn of 1997 and placed in storage until being purchased by the South Tynedale Railway Preservation Society. This locomotive is a twin of “Chaka’s Kraal No. 6” (Hunslet 0-4-2T, works No. 2075, built in 1940), which was based at the South Tynedale Railway between September 1988 and September 1999. This locomotive currently requires a major overhaul however a recent boiler inspection and ultra sonic test has revealed that only a retube and slight remedial works will be required to bring the boiler up to specification. This work will be undertaken as time and funds allow. “Barber” was built by Thomas Green and Company Limited of Leeds, West Yorkshire, England in 1908, works No. 441. This locomotive formerly worked at Harrogate Gas Works, Harrogate, North Yorkshire and was named “Barber” after the Chairman of the company Francis Barber. It was preserved by the Narrow Gauge Railway Society and is on loan from Leeds Industrial Museum. 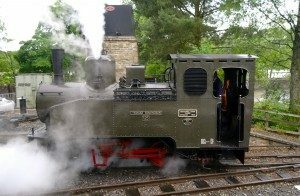 In 2011 the railway launched an appeal to raise £100,000 aimed at restoring this iconic locomotive back to working order and after a May Bank Holiday Gala in 2015, Barber returned to regular service at South Tynedale Railway. Barber is thought to be the only surviving locomotive built by Thomas Green and Company Limited of Leeds in the northern hemisphere; although there may be three or four more elsewhere. An 0-6-2ST built by Greens of Leeds, 441/1908, Barber spent its working life at Harrogate Gas Works, and was named after the Chairman of the Gas Company – Francis Barber. Despite rebuilds, it fell into disuse in 1949. In 1953 the North East Gas Board agreed to it being preserved if the NGRS (Narrow Gauge Railway Society) could find a home for it. In 1956 Leeds City Museum agreed to house it and it went to the Museum’s Copley Hill store, where NGRS members started to restore it. It was subsequently displayed in the new Armley Mills Museum. In 1983 it was moved to the workshops of the Bradford Industrial Museum, where some work was done; it was returned to Armley Mills in 1991, where it remained in pieces, many major parts exposed to the elements. The current initiative to restore Barber was initiated by a NGRS and South Tynedale member who read the special issue of The Narrow Gauge News devoted to Harrogate Gas Works (TGN 146, Spring 1995) and was moved to visit Armley Mills. Subsequently, in 2004, it was transferred to the South Tynedale Railway on a five year loan, with the intention that restoration would start immediately. Built by Hudswell-Clarke of Leeds in 1952 as works no. 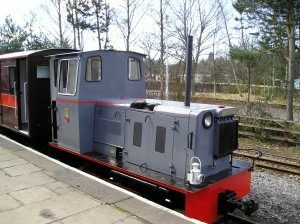 DM819, “Naworth” has a tractive effort of 100 h.p. produced by a Gardner 6LW engine and 3 speed gearbox. This locomotive formerly worked for National Coal Board, North East Area at Horden Colliery, County Durham.Naworth is painted with a grey body, red radiator cowling, black frame and wheels, red coupling rods and buffer beams and is once again running with the nameplates which were carried when in its former green livery. This diesel mechanical locomotive was constructed in 1952 by Hudswell-Clarke & Co. of Leeds, works no DM819, as a flameproof, underground mine locomotive for the National Coal Board. These locomotives were distributed by Huwood & Co., of Gateshead, hence the trade name “Huwood-Hudswell”. It was delivered new to Horden Colliery, County Durham as their No. 2 (Plant 2304/7), where it remained in service underground until withdrawn in February 1979, when it was sent to Ashington Colliery Workshops, Northumberland. It was bought by the Durham Narrow Gauge Group in 1981 and transported to Alston. This locomotive is fitted with a 100 horse power, 6-cylinder Gardner 6LW diesel engine, with a fluid coupling driving a Bostock and Bramley synchro self shifting air change, 3 speed gear box. The final drive is by jackshaft and coupling rods, giving maximum speeds of 3.8, 7.3 and 14 mph, and a maximum tractive effort of 8410 lbs (3815 kg). Built by the Hunslet Engine Company of Leeds in 1952, works no. 4109 with a tractive effort of 70 h.p. from a Gardner 4LW engine and 4 speed gearbox.No 9 was rebuilt by South Tynedale Railway in 1992 having formerly worked for National Coal Board, North East Area at Seaham Area Training Centre, County Durham and is used on works trains and as a standby passenger locomotive. This diesel mechanical locomotive was built in 1952 by the Hunslet Engine Company of Leeds, works no. 4109, as a flameproof underground mine locomotive for the National Coal Board. It was supplied new to Horden Colliery, County Durham (Plant No. 2403/50). It was converted from underground to surface use at the N.C.B. Ashington Central Workshops, in Northumberland in 1975, before returning to Horden in 1977 to shunt the surface yard. It was returned to Ashington in 1982 prior to transfer to the driver training centre at Seaham, County Durham where it was in use until it was bought by the Durham Narrow Gauge Group in 1987. 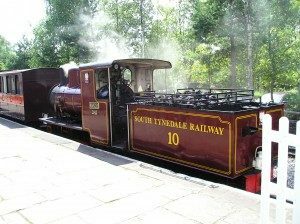 The locomotive was purchased by the South Tynedale Railway Preservation Society in 1991, and conversion work was carried out to include the modification of the air system for use in passenger service, while retaining the air driven starter motor. The footplate has been widened, a new cab built, new engine covers and drag boxes fabricated and a full mechanical overhaul was carried out. The locomotive is fitted with a 70 horse power, 4-cylinder Gardner 4LW diesel engine, with Hunslet clutch, driving a Hunslet 4 speed, air change, gear-box. The final drive is by jackshaft and coupling rods, giving maximum speeds of 4.5, 6.5, 10 and 15.5 mph and maximum tractive effort of 5150 lbs (2336 kg). The locomotive entered regular passenger service in 1994, but initially required two persons on the footplate. It was later fitted with a full emergency braking system, similar to that on locomotive No. 4. It is now the main works locomotive, but is available for use on the passenger services and operated the diesel service from 2008 to 2010. Height to top of cab: 9 ft 0 in. (2,743 mm). Built by Hunslet Engine Company of Leeds in 1967, works no. 6646 with a tractive effort 60 h.p. from a Gardner 4LW engine and single speed gearbox.This locomotive formerly worked at Broughton Moor NATO Depot, Maryport, Cumbria and is usually used in Alston yard or on works trains. Although it is fitted with air-braking it is not suitable for passenger service. This diesel mechanical locomotive was built in 1967 by the Hunslet Engine Company of Leeds, as works no. 6646, it was supplied new to the 2 ft 6 in gauge, Broughton Moor NATO Ammunition Depot, Department of the Environment, Maryport, Cumbria where it operated until withdrawn in 1987. It was originally purchased by S. Morgan, a scrap merchant in Barrow-in-Furness, Cumbria. It was bought several members of the South Tynedale Railway Preservation Society, known as the Durham Narrow Gauge Group in 1990 and it was transported to Alston. Shortly after its arrival at the South Tynedale Railway, the locomotive received a major rebuild, which included alteration of the air brakes, while retaining the air driven starter motor, a full mechanical overhaul and it was regauged to 2 ft. The locomotive is fitted with a 60 horse power, 4-cylinder Gardner 4LW diesel engine, connected to a torque convertor driving a single speed Hunslet gear-box, with hydraulic clutches for forward and reverse. The final chain drive gives a maximum speed of 7 mph, and a maximum tractive effort of 4750 lbs (2155 kg). This locomotive is a 100hp, Hudswell-Clarke, 0-6-0 diesel mechanical locomotive. “Old Rusty’s” original dimensions were identical to No. 4 “Naworth” but the full original chassis has been used for the rebuild for passenger duties.Terracotta body, red coupling rods, wheels and buffer beams, black frames. Privately owned. This locomotive is an ex-mines loco of Hudswell-Clarke manufacture, built in 1961, works number 1247. It has six coupled wheels, is eighteen feet long and weighs in at fifteen tons. The engine has a six cylinder Gardner 6LW engine, rated at 100 h.p., with maximum revolutions of 1750 r.p.m. It last worked for the National Coal Board at Vane Tempest colliery, near Seaham, County Durham, where it was used for training drivers. When the colliery closed, it was bought by Arthur Belshaw and taken to the South Tynedale Railway. The locomotive being surplus to requirements was purchased by a member of the Welsh Highland Railway at Porthmadog, Gwynedd, in North Wales and it arrived there in June 1996. Since then, it has been stripped down to frames, engine and gearbox, steam cleaned, and the old paint removed. The frames and wheels have had four coats of new paint, the engine and gearbox have received two coats each. Work is underway to prepare the engine back to working order with the construction of a new engine cover and cab. When complete the locomotive is intended to be used on works or passenger trains on the South Tynedale Railway. Tractive effort: 8,500 pounds approx. or 37.8kN. These identical steel bodied coaches entered service from 1991. The steel bodies were fabricated by Falmech of Alston to South Tynedale Railway Preservation Society design, mounted on new, diamond-framed bogies, built by Hudson of Aston-in-Makersfield, to a modified standard design.All of the running gear, air braking on all wheels, internal lining, end and side door fabrication, fitting out and painting carried out at Alston by volunteers.The coaches were last refurbished in 2002-2004 when improved 2 + 2 seating was fitted. It is hoped to begin a further refurbishment of these coaches shortly, fitting new 2 + 1 seating and heating. One of the 45 modern steel vehicles supplied to Sierra Leone in 1961 as an independence gift from the British government. They were built by the Gloucester Railway Carriage and Wagon Co Ltd. for the 2ft 6ins (760mm) gauge Sierra Leone Railways.The majority were third class with longitudinal slatted seats, while the remainder were first class with comfortable leather seats. 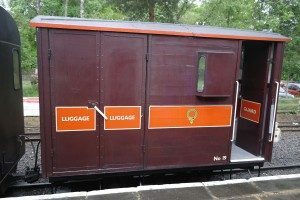 All had toilet compartments and corridor connections.Following the complete closure of Sierra Leone Railways in 1975 four vehicles, one first and three thirds, were obtained by the Welshpool & Llanfair Light Railway (WLLR). Following a review of the coaching requirements of the WLLR, one third class coach was scrapped and one completely refurbished by Calea Ferata Ingusta (CFI) of Brad, Romania.The first class coach was then sent to CFI, while the remaining third class coach, 1048, was deemed surplus to requirements and acquired by the South Tynedale Railway. uilt at “16 Februarie” Remarul Locomotive Works, Romania, probably during the 1930’s as a 760mm gauge CFR (Romanian State Railways) “Post Vagon”. It has been rebuilt by CFI as a passenger coach with access for wheelchairs, having seats for 27 passengers and space for two wheelchairs.The overall length is 40 ft (12180 mm) with the body 37ft 9ins (11500mm) long, 7ft 2ins (2180mm) wide at waist, the rail to roof height is 10ft 4ins (3150mm), with the vacuum-braked bogie centres 28ft 10ins (8800mm) apart.The style of seating is similar to that in coach no 11, while heating is provided by diesel hot air heaters via underfloor ducting. The coach is carried on Bulgarian roller bearing bogies, using Romanian freight wheelsets re-gauged to 2ft, and fitted with air brakes similar to those on coaches 5 to 7. A 4-wheel brake van, constructed on the chassis of a 4-wheel open flat wagon, originally built, in 1939, by Chas. Roberts & Co. Ltd., Horbury Junction, Wakefield, and one of five purchased by the STRPS in 1991 from Broughton Moor NATO Ammunition Depot, Maryport, Cumbria.The vehicle was stripped to a bare chassis, the brake gear altered to 2ft (610mm) gauge, and new sets of wheels and axles, also regauged from 2ft 6in (760mm), obtained.The body is divided into three compartments. At the south end is a self-contained section with double doors for luggage, bicycles and buffet supplies. To the north is a compartment at platform height for the guard with a door on each side having a drop-light window. There are steps up to a raised central section which has a clerestory light for the guard to observe the train while in motion. Beneath the floor of this section is about one ton of rails to increase the weight of the vehicle. Again constructed on the chassis of a four wheel wagon from R.A.F. Broughton Moor, which was re-gauged from 2 ft. 6 inch to 2 ft. 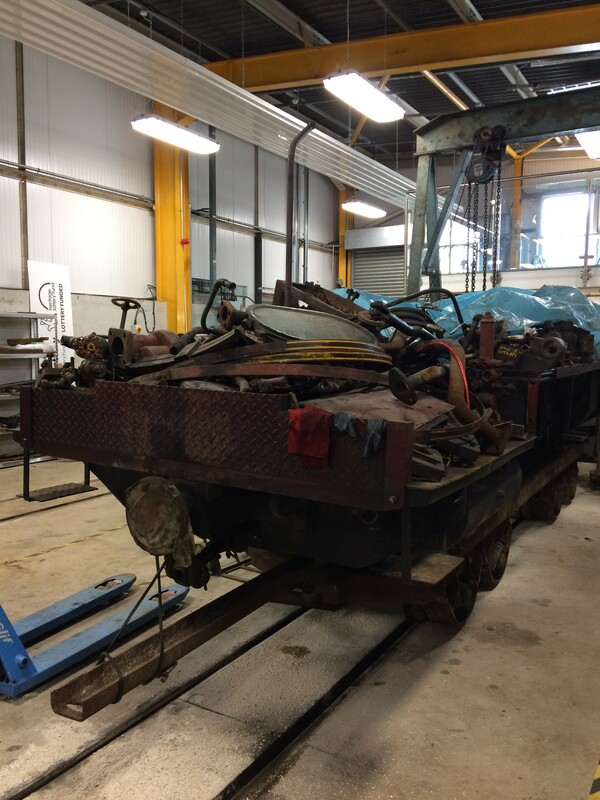 The vehicle was stripped to a bare chassis, the brake gear altered to 2ft (610mm) gauge, and new sets of wheels and axles, also regauged from 2ft 6in (760mm), obtained. The width of the chassis was increased to 6ft 6in (1980mm) and a steel frame for the body constructed. Prior to fixing the wooden floor, lengths of old rail were attached to the top of the chassis to increase the weight by approximately one tonne to improve the braking force.The body panels are of timber, and the interior is divided into two, interconnecting, compartments, each with a pair of end windows. The compartment at the northern end contains the guard’s hand- and air-brake controls, a large locker, and has a single inward opening door and a steel ducket window on each side. The second compartment is for luggage, with a pair of outward opening doors on each side, and a folding seat for the use of travelling p.w. staff.This entered service on 1st of April 1995. The folding seat was subsequently replaced by shelving for buffet car supplies.